The next step was wireless charging for the iPhone, the ability to drop Apple’s flagship product on a charging mat and juice it up via a process known as induction. This accessory is taking longer to make due to a series of technical hurdles, slowing the company’s wireless strategy and highlighting supply-chain challenges that have hampered product launches in recent years. Apple said in September that the iPhone X and iPhone 8 could be charged wirelessly. It recommended charging hubs from Mophie and Belkin, an unusual move for the consumer-hardware specialist. Apple also announced its own AirPower charger, but said it wouldn’t be released until 2018. 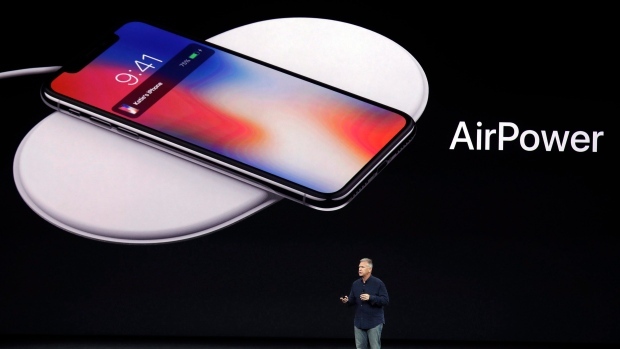 Unlike wireless chargers on the market today, the AirPower is designed to charge three devices simultaneously: an iPhone, Apple Watch, and AirPods with a still-to-be-released wireless charging case. The company plans to produce the charger with Pegatron Corp., which also builds some iPhones, according to a person familiar with the arrangement. Wireless accessories have become a key way for Apple to differentiate its products. The wireless synchronization of AirPods and the Watch with Apple’s other devices are compelling features. And the pricey accessories are only truly compatible with Apple devices, giving consumers more reasons to stick with iPhones and iPads over competing smartphones and tablets. All of these accessories are part of Apple’s Other Products business, which has been growing rapidly. The AirPower charger should bolster this business -- when it finally arrives. The wait is another indication that Apple continues to struggle with last-minute engineering and manufacturing issues, particularly for first-generation accessories. Chief Executive Officer Tim Cook has overseen the shipment of hundreds of millions of major devices since taking over as Apple’s top executive in 2011 -- and for many years prior as chief operating officer. But nearly every significant new Apple accessory has faced delays in recent years. The first major new accessory to the iPhone launched under Cook was the Apple Watch. Announced in 2014, it was marketed to go on sale in early 2015. It ended up initially going on sale at the end of April in limited quantities, with more models being subsequently released in stores in May and June. When the wireless Apple Pencil came out in 2015, it was difficult to find in retail stores for several weeks. In 2016, when Apple launched AirPods, the company planned to release the accessory in October. The earbuds came out close to the December holiday season. A year later, the HomePod was announced in June 2017 for release in December of that year. It ended up going on sale this February. --With assistance from Debby Wu.